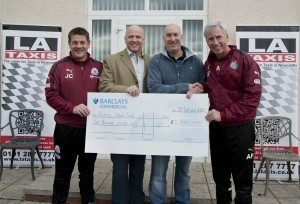 Tyneside’s business and sporting world has united together to provide much needed funds for children with severe special education needs. Rob Armstrong, director of leading recruitment agency; MTrec Recruitment and Newcastle taxi firm, LA Taxis, has supported Hadrian School in Benwell for many years by supplying computers and helping to raise money for specialist equipment to help the children with their education and general welfare at the school. The primary day school caters for the needs of pupils aged between two and eleven years with a range of additional needs including complex, severe learning difficulties and profound and multiple learning difficulties. It has established itself as ‘an outstanding school’ winning many accolades from Ofsted, Charter Mark and Investors in Children. The school has around 120 pupils and also provides courses and support to parents relating to their children’s disabilities. The increasing cost of specialised equipment means that the school is constantly looking at ways to raise funds to buy new equipment. Now, Mr Armstrong an ex West End lad himself has teamed up with his beloved Newcastle United and has promised to raise £85,000 for the school by donating a raffle prize that every “toon” fan would love to win. As if that wasn’t enough, the Newcastle-Gateshead Hilton Hotel have pledged rooms with dinner the night before the match and a fleet of LA Taxis will transport the winners in style to the football ground. 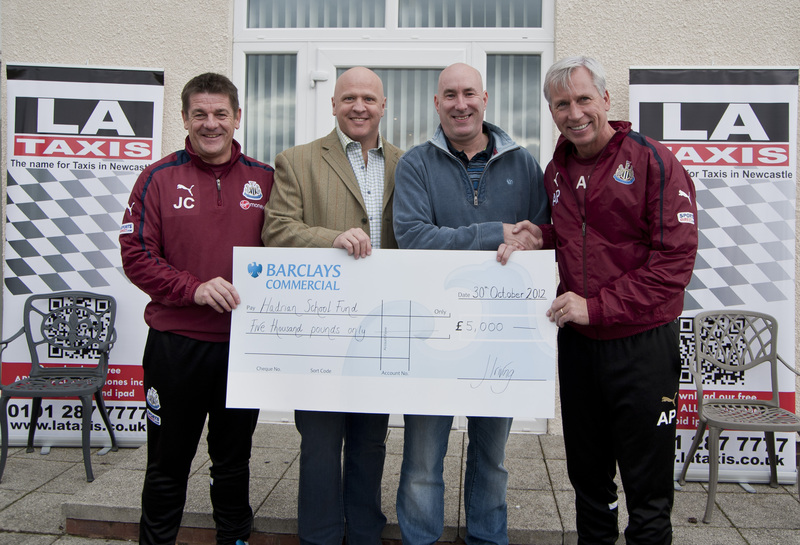 Newcastle United manager, Alan Pardew helped to kick off the fundraising with a cheque for £5000 from the club which was presented to an eager and excited group of children from the school at the Benton training ground. In addition, the club have also donated a second box for the match making both prizes worth a total in excess of £5000. The school will also have the opportunity to collect even more funds as the club have given permission for a bucket collection at a forthcoming match. The money raised will go towards the building of a new therapy resource to deliver Rebound Therapy five days a week in and out of school hours. Rebound Therapy is the therapeutic use of a trampoline to overcome physical, perceptual, communication disabilities. “I wanted to do something to help these fantastic kids by improving the facilities and equipment at Hadrian School,” said Mr Armstrong. “I’ve pledged to help them raise £85,000 by April and I’d urge all Newcastle fans to dig deep and buy as many tickets as they can afford to help this very special school, “he said.